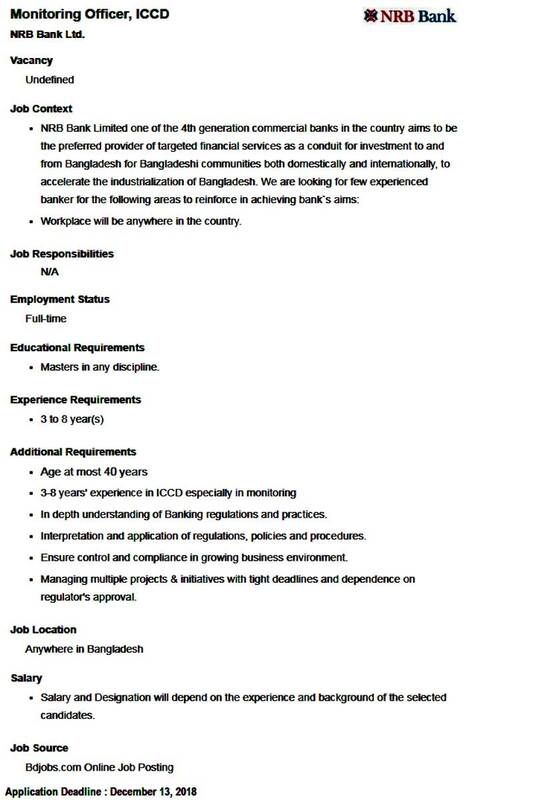 NRB Bank Job Circular 2018 has been found on my website. NRB Bank is one of the fourth generation private sector banks to have begun operations in 2013. Recently NRB Bank has been published Job Circular 2018. 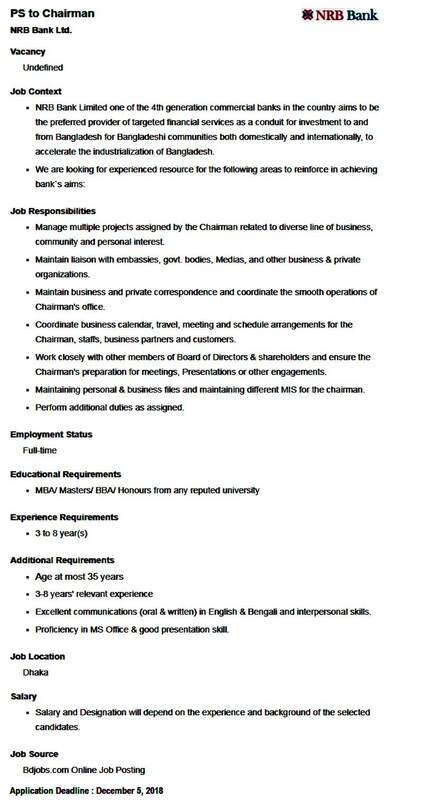 NRB Bank has been published job title are as follows Chairman`s Secretary Officer to SPO. NRB Bank aims to be the leading dedicated financial institution for NRB’s to invest in Bangladesh and for Bangladeshi individuals and corporations to access the international market. NRB Bank Job Circular 2018. ■ Job Description: Maintain NRB Bank’s internal control standards implement and observe Compliance Policy and maintain awareness of operational risk and minimize the likelihood of it occurring. 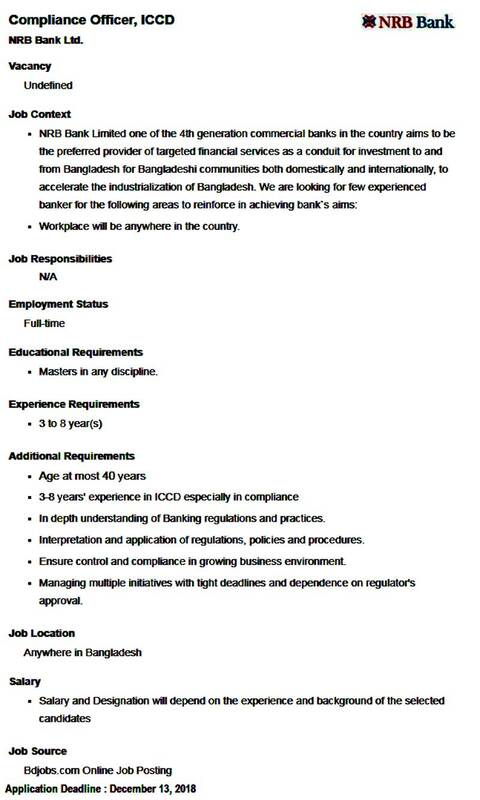 ■ How to Apply: Apply with full Resume to Head of Human Resource Division, NRB Bank Ltd, Corporate Head Office, Richmond Concord (7th Floor), 68, Gulshan Avenue, Gulshan Circle-1, Dhaka-1212, Bangladesh. NRB and Premium banking to meet the needs of a broad customer base service. With a mission of building long-term commitment with our clients. 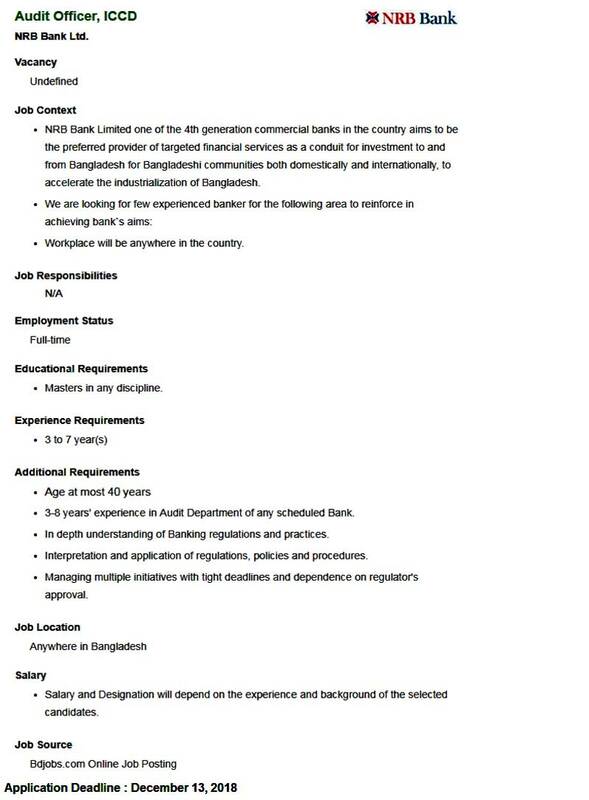 NRB Bank Job Circular 2018 also found the bank official website. NRB Bank will be providing the right solutions that combine professionalism, expertise, and financial strength, and aims to be the preferred provider of financial services. NRB Bank demonstrates our bank with the motto, not just another Bank through our Values Dynamic, Innovative, Global, Integrity, and Techno-Centric to create distinct financial Bank locally and internationally. NRB Bank Job Circular 2018.